Photo: Children of the local community gather around our main campus entrance. April 1, 2016. We are happy to report that we recently purchased a small plot of land adjacent to our main campus which will provide a separate entrance to our medical clinic off the main road. This is a great blessing because now patients won't have to come through the school grounds to get to the clinic, providing less distractions and more privacy for our students. 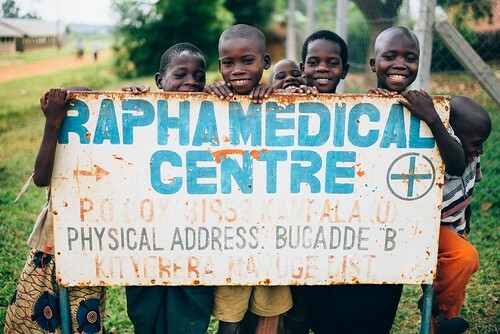 The Rapha Medical Clinic is housed in a facility on our main campus in the Mayuge district of southeastern Uganda. It contains a 35-bed in-patient ward, several examination rooms, a pharmacy stocked with basic medicines, and offices for medical staff. We have four full-time nurses and one resident doctor, and we bring in another doctor twice a week for appointments. As often as funding permits, we hold 2-day medical camps. During the camps we bring in a larger team of doctors, a dentist, and more nurses. Although we’re not staffed for full in-patient capacity at 35 beds during a normal week, we do utilize that capacity during medical camps. With your support and contributions from our generous donors, we hope to improve the Rapha medical clinic by purchasing an ultrasound machine, a dental chair, more laboratory equipment, more microscopes and testing kits, a blood CD4 count machine, a medical refrigerator to store essential laboratory supplies, mosquito nets, and a solar power system. All of these items will enable us to provide a higher level of quality care to the local community. Area residents are grateful for the clinic, as it is the only one available to effectively serve the local town and surrounding villages. Since its construction in 2013, the Rapha Medical Clinic has been busy at work serving dozens of community members weekly. Our most recent success stories include three children who were treated for malaria — they came to us almost at the point of death and were admitted for three days, back to full health when they were discharged. Another recent patient was an adult who was struck by a motorcycle taxi — he was rushed to our clinic with several wounds and severe bleeding, but he was treated by our medical staff and is now healing well. Yet another recent patient was an adult who was injured with a head wound during the recent national political elections — he was also treated at our clinic and is recovering well. In other good news, our students resumed to a full schedule on March 22nd, and they are hard at work studying English, math, chemistry, physics, biology, commerce, economics, history, geography, fine art, and Christian studies. The start of the school year was disrupted by recent unrest surround the presidential and parliamentary elections in Uganda. The students are very excited to see the construction of a new school building on campus, which is phase two of our goal to get our high school fully accredited — construction should be completed in May. The new building will house a new science lab, the school library, the computer lab with 30 computers, more offices, and the examination hall. We will also equip the science lab with all of the necessary science apparatuses, chemicals, solutions, shelves, lab tables, and chairs. With your generous contributions, we also hope to raise $60,000 to build two well-furnished dormitories for the boys and girls to have separate living arrangements, each accommodating 100 students. We have a goal of accommodating 200 students in all — 100 girls and 100 boys. Raise Awareness: please share or save this photo as a favorite!